Join us tomorrow, June 15th, 2013 at University of the District of Columbia for the DCPS College Readiness Workshop! Are you a student interested in attending college? 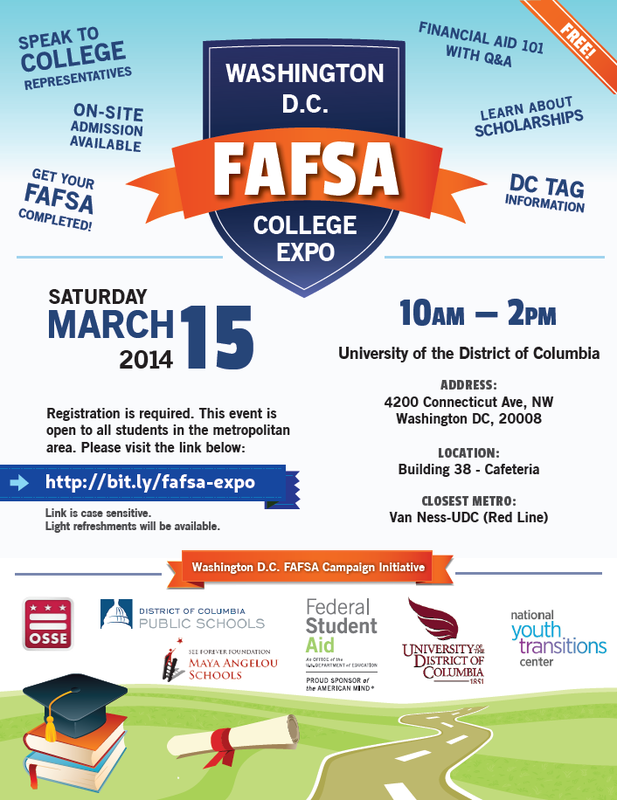 Are you a parent seeking more information about how to afford college? Do you wonder how a student can be admitted to the college of their choice? Do you wonder how a student can best prepare for college success while in high school? Would you welcome the opportunity to learn directly from admission officers and scholarship administrators how they evaluate student applications? The DCPS College Readiness Workshop will provide scholars and their families with an opportunity to engage admission and financial aid professionals from selective colleges, universities, programs and scholarships around the country. Scholars and their families will be exposed to what will be expected of them in the college admissions process. You will also learn about programs that can support your goals of accessing a competitive, challenging college education. High-Achieving 9th through 11th grade students and their families from the District of Columbia and surrounding communities are encouraged to attend.